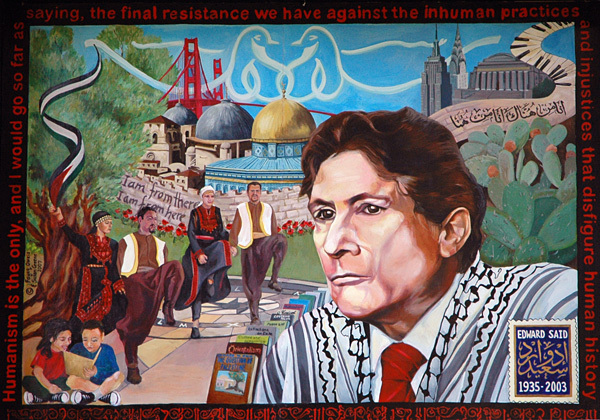 On November 2nd, 2007, the Arab American community in the San Francisco Bay Area and the Academic community at San Francisco State University inaugurated a permanent mural at Cesar Chavez Student Center that celebrated Palestinian culture and honored the late professor Edward Said (1935-2003). The mural project and the approval process took almost three years. The process has been rewarding, very challenging, sometimes stressful, and faced a number of obstacles that resulted in the modification of the design. I am honored to have been selected by the mural project committee to present a design and a vision for the mural. At the early stage, I decided to invite my friend, Susan Greene, to join me in this effort. We worked together to come up with visual images that represented the elements that were proposed by the students, the community, and the mural project committee. It was not an easy task, and more than 20 different layouts were presented and went through changes to come up with the final design. This mural is the first of its kind on any American university campus. It has been achieved after a long, unrelenting, and sustained struggle spearheaded by the Palestinian students at San Francisco State University, their friends, and community support. The mural is located on a building that hosts a number of murals including one that honors the African American leader and activist Malcolm X and another one that honors Mexican American labor leader Cesar Chavez. With representing the Palestinian issue, the mural addresses a connection in the struggle with other ethnic communities. The mural contains many visual images that represent elements that were proposed and discussed by the students and the community. More than 20 different layouts were presented and went through changes to come up with a final design that contains over 25 elements and symbols. These elements and symbols represent many issues, including: exile, diaspora, the Palestinian experience, the life and work of Edward Said, Arab culture, and identity issues. 1) Professor Edward Said (1935-2003): Edward Said was a Palestinian Arab-American academic, educator, writer, philosopher, thinker, scholar, civil and human rights activist. His writing is an inspiration for Arab Americans. His activism for human rights, justice, and a peaceful solution to the Palestinian-Israeli conflict is also an inspiration to millions of people around the world. He was one of the greatest thinkers and scholars of America in the 20th century because he broke down the stereotypes of “Orientals” that have been perpetuated for hundreds of years. Said is wearing a Palestinian headdress or scarf (Kuffiyya, or Hatta), which is a cultural garment that has come to symbolize the struggle in maintaining and preserving Palestinian culture and identity. 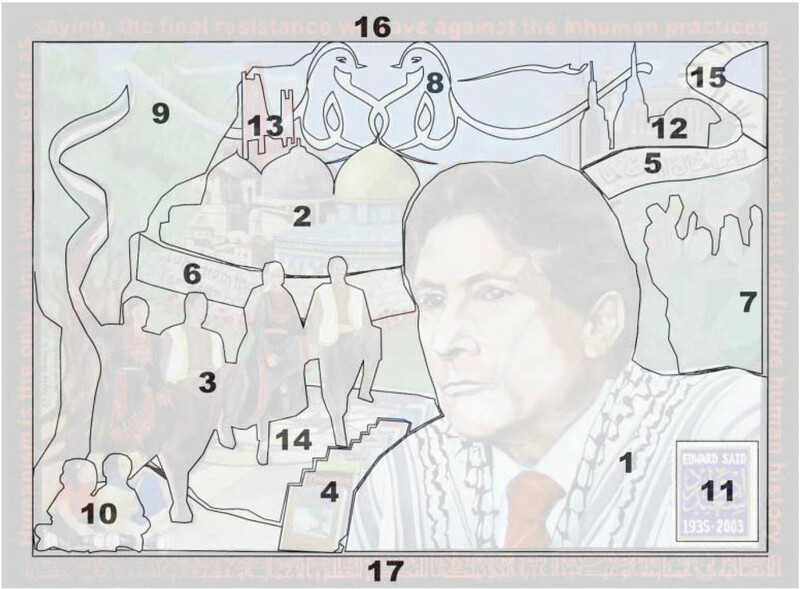 2) The City of Jerusalem: Jerusalem is the birthplace of Edward Said, and its representation on the mural through its landscape and monuments complements the poem in 5 and 6 (“I am from there…”). Jerusalem represents the genesis of Said’s thought. Since Said was born and lived in Jerusalem, his earliest experiences and hence his thought process were influenced by Jerusalem. 3) The Palestinian Folkloric Dance: Debka is a traditional, folkloric Arab dance. Palestinian Debka is a nonviolent form of resistance and preservation of Palestinian culture and heritage. It is presented on the mural to bring attention to the rich culture of the Palestinian people, and performed by students at San Francisco State University in the Malcolm X Plaza (no. 15) wearing traditional Palestinian clothing. One of the women dancers is holding a Palestinian flag. The presence of Palestinian women pays homage to the matriarch responsible for maintaining and preserving Palestinian life and culture. Palestinian women play an integral part in Palestinian life, society, resistance to occupation, and in the struggle for human rights through mobilization and education. For the faces of the Debka dancers, and to acknowledge the students who worked very hard on the project, we painted the faces of GUPS leaders: Sharif Al-Najjar, Lubna Qutami, Ramsey Al-Qare, and Jackie Husary. 4) Edward Said’s Books: Edward Said’s scholarly work and his contributions to academia are imperative to and have influenced such fields as literary studies, comparative literature, area studies (specifically the Middle East/ the Arab world/Islamic world), anthropology, political science, comparative religion, and music. Books represented include: The Question of Palestine, Orientalism, and Covering Islam. 5) Poem honoring Edward Said – in traditional Arabic Calligraphy: Mahmoud Darwish (1941-2008) was a well known Palestinian poet and a personal friend of Edward Said. He wrote a farewell poem in Arabic dedicated to Said in 2003. For the mural, we are selecting a verse of the poem that reads: ana min hunaak, ana min huna, which translates to: I am from there, I am from here. The selection of this poem serves many purposes: it recognizes Said’s identity as an Arab-American and reflects the identities of others in the diaspora. Arabic calligraphy, with many styles, is an art that has been used to decorate architectural monuments, manuscripts, and objects of daily life for over 1,400 years. The Arabic poem noted above will be rendered in an artistic form to enhance the Arab and Eastern influence of the mural. 6) Poem honoring Edward Said – English Translation: The same verse noted above in (no. 5) is rendered in English on the Wall of Jerusalem. 7) Cactus Trees: Cactus trees (Sabr in Arabic) which has a double meaning, of cactus pears and patience. They represent Palestinian people’s desire for peace and patience waiting for it. It is a resilient plant and part of the landscape of Palestine. 8) Dove: The dove is the universal symbol of peace and represents the Palestinian desire for a peace for all people. Two doves are rendered in Arabic calligraphy using the word “Salaam” which is Peace in Arabic. 9) Olive Tree: Olive trees are indigenous to the land of Palestine. Palestinians have a deep cultural connection to the olive tree because it represents their subsistence, their deep history and their profound connection to the land that gives them life. Furthermore, the olive branch is a universal symbol for peace which is consistent with the most important theme of Palestinians’ desire for peace. 10) Children Reading: Children are the bearers of the future who will carry on the deep cultural traditions of the Palestinians. Their presence on the mural represents the recognition of Palestinian children’s right to freedom, life, and education. The children reading a book complements the murals overall theme and its dedication to a great writer. 11) Postage Stamp: With the intention that one day Said will be recognized on a U.S. postage stamp as one of the greatest thinkers of the 20th Century, The postage stamp includes the name of Edward Said in both Arabic and English. 12) New York Landscapes: The landscape of New York, where Said spent most of his life in exile, is represented by a building at Colombia University, where he taught, and New York City monuments including the Chrysler and Empire State Buildings. 13) Golden Gate Bridge: In addition, the Golden Gate Bridge, in conjunction with images of the New York City landscape illustrates the vast geographical scope and reach of Palestinian diaspora in the United States. It is also a recognition to the city of San Francisco as the first city to host such a mural. 14) Malcolm X Plaza: Cesar Chavez Students Center’s Malcolm X Plaza is included in recognition of Student activism at San Francisco State University, as well as to pay homage to the connection between the Palestinian-American and other Civil and Human Rights struggles in the United States. 15) Piano Keys: The piano keys honor Edward Said’s artistic talent. They also honor his efforts in using music to bridge the Palestinian-Israeli divide. Together with conductor Daniel Barenboim, he created the East-West Diwan Orchestra in 1999, featuring young Israeli and Palestinian musicians. 17) Traditional Arabic Calligraphy: Each quotation in the mural is translated into Arabic and rendered in a traditional Arabic calligraphy style, recognizing the Arabness of Palestinian culture and demonstrating the importance of art, language, and culture to Arabs. In almost all of the designs that were presented to the mural committee, two elements were proposed: Handala and a house key. These two elements were either presented separately or combined together as in the figure below. Handala represents a refugee boy holding a pen in the shape of a sword to express the concept of “a pen is mightier than a sword” and it is a reproduction from Naji al-Ali cartoons. The house key is made of Arabic calligraphy with the word “awda” which means return and to symbolize the issue of the “Right to Return” of the Palestinian refugees. Due to the university’s administration objections and misinterpretation of these two elements, the mural was modified. The concept of the “Right to Return” remained on the mural through the cactus trees.